Early detection of mesothelioma is notoriously difficult. But a number of tests currently being researched provide hope that this aggressive cancer caused by asbestos exposure may be diagnosed earlier than current methods allow. Mesothelioma patients rarely exhibit symptoms until the cancer is in its late stages, which is typically decades after the asbestos exposure that caused it. The path to mesothelioma diagnosis often begins with a standard physical exam. Be sure to tell your doctor if you ever worked with asbestos or may have otherwise been exposed to asbestos. 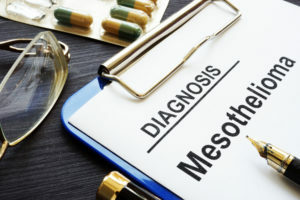 Mesothelioma diagnosis is further complicated by the fact that the disease shares symptoms with other medical conditions—including lung cancer, which may also be caused by asbestos exposure. Misdiagnosis of mesothelioma is not uncommon, particularly when symptoms are just beginning to manifest themselves. The road to diagnosing mesothelioma generally begins as most medical evaluations. Your physician may review your medical records and conduct a physical exam. It’s important to discuss any known or potential asbestos exposure with your doctor as soon as possible. After this initial assessment, your physician may recommend other diagnostic procedures. Current diagnostic tools for mesothelioma rely in part on testing the blood for the presence of two compounds: fibulin-3 and soluble mesothelin-related peptides (SMRPs). 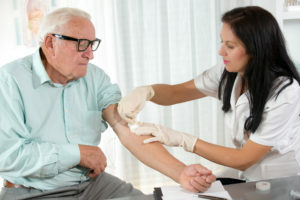 Ultimately, as physicians rule out other conditions and hone in on mesothelioma, a biopsy will be required to determine the location and extent of the cancer. There is no known cure for mesothelioma, but the earlier the disease can be detected the earlier treatment can begin. And the earlier treatment can begin, the better the chances that treatment can improve a patient’s quality of life and extend lifespan. With earlier detection and treatment, medical professionals hope that it may be someday possible to effectively treat the disease. The aggressive nature of the cancer and the lack of early diagnostic measures are major factors in mesothelioma’s high mortality rate. Scientists around the world are currently developing techniques to detect cancers—including mesothelioma—at an earlier stage. These methods include new breath-based tests and blood tests designed to identify early markers for cancer. One of the tests in development is led by the Cancer Research UK team in Cambridge, where researchers are working on techniques centered on “breathomics” that assess breath samples for cancer biomarkers. A blood test currently in clinical trials may help detect mesothelioma early with the aid of a CTC-Chip, which assesses circulating tumor cells. While this test is not aimed specifically at mesothelioma, it has proven useful for identifying a multitude of cancers through evaluating breath samples for volatile organic compounds (VOCs). A drastic change or increase in the production of VOCs can create different patterns and odors in the patient’s breath, which could provide a noninvasive diagnostic tool for detecting the early stages of cancers such as mesothelioma. The test involves a small face mask that patients wear for around 10 minutes as their breath is monitored for these signature patterns and odors. Another team in Belgium has been working on a breath test specifically for pleural mesothelioma that has shown increasing potential for regular screening use. This test involves a small device that users breathe into as the VOCs in their breath are evaluated for the specific patterns that mesothelioma creates. These breath tests could prove revolutionary in the early detection of mesothelioma if researchers are able to work out how different cancers create specific VOC patterns. Devices utilizing this new diagnostic method are still in trials and are not expected to be readily available to general practitioners for at least a few years. However, they do offer hope for earlier diagnosis for mesothelioma. Other innovative tools have been developed for blood tests, such as the CTC-Chip, which is used to detect circulating tumor cells in cancer patients. Circulating tumor cells have been known to researchers for more than a hundred years, but they are difficult to capture in testing, and current diagnostic tools are not sensitive enough to detect them accurately. The CTC-Chip uses the science of manipulating and controlling fluids on a micro-level to significantly increase the sensitivity of blood tests, as well as the capture rate of tumor cells. In order to test for these cells, blood is taken from the patient and pressed onto the CTC-Chip. Researchers are currently working on refining this new test through clinical trials to locate mesothelioma early, which would be less invasive than the traditional biopsy and increase the sensitivity of the devices. 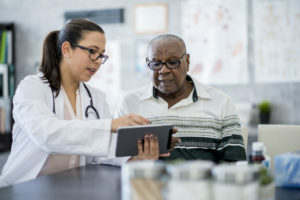 While these emerging diagnostic tools offer hope for earlier mesothelioma detection, The Williams Law Firm understands that many asbestos exposure victims need help now. Although these tests show promise for the early detection of mesothelioma in the future, many asbestos exposure victims and their families are suffering from the physical, emotional and financial tolls of this disease now. Led by distinguished mesothelioma attorney Joseph P. Williams, The Williams Law Firm is dedicated to helping mesothelioma patients and their family members recover the compensation they need to cope with the costs of diagnosis and ongoing care. If you or a loved one was diagnosed with mesothelioma, please call us today at 855-575-MESO (6376) or contact us online for a free, no-obligation consultation. We can arrange to meet you at your home or hospital room, or connect via video conference, and we don’t charge for our services until we secure compensation on your behalf. The Williams Law Firm is based in New York, but we work with asbestos exposure victims and their families nationwide.